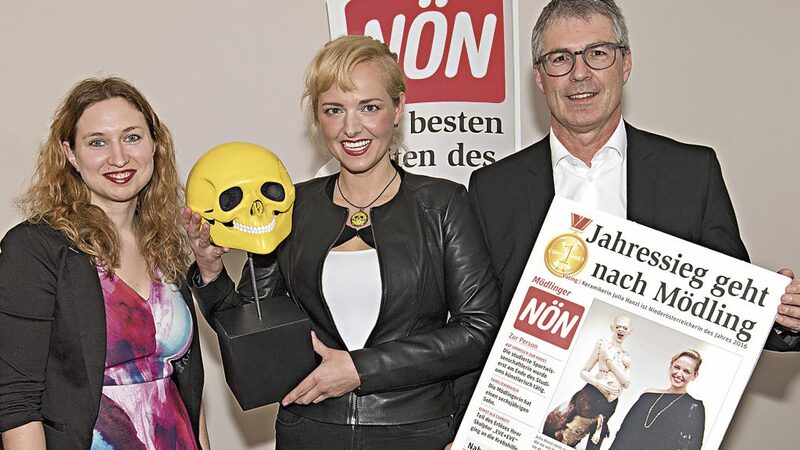 68.4% voted for Julia Hanzl as Lower Austrian of the year 2016. A yellow laughing skull. The so-called “Smiley” (see picture) is now a trademark for the ceramist Julia Hanzl. With the slanting sculptures, the Mödling based sculptor managed to convince the NÖN.at users: She was voted with 14,000 votes to the Austrian of the year. In December Hanzl got voted for the Lower Austrian of the month. So she qualified for the finals and fans and users on the NÖN.at website made her from twelve monthly winners to the overall winner of the year 2016. “I’ve shared the voting on Facebook and have been constantly sending it to all of my WhatsApp contacts,” says the 35-year-old. With 5,000 friends on Facebook, Hanzl could mobilize a large community. “Even from America there were people who have voted regularly for me,” Hanzl is glad about everyone who had given his hat. Thanks to that, she can also look forward to a great prize: a wellness weekend at the Hotel Panhans at Semmering for two people. At the moment the ceramist works on a commissioned portrait. In addition to such works, it is difficult to finish enough sculptures for a separate exhibition. The artist works is represented by Vienese galleries (Galerie Artziwna, Nicholas Treadwell Gallery) and provides many art buyers in the US. Right now Ms Hanzl plans a single exhibition in Lower Austria. In the last few months, the Ms Hanzl has worked a lot on sculptures, where she combines ceramics with animal taxidermies. “There are enough sculptures to make my own exhibition,” Julia Hanzl reveals her future plans.